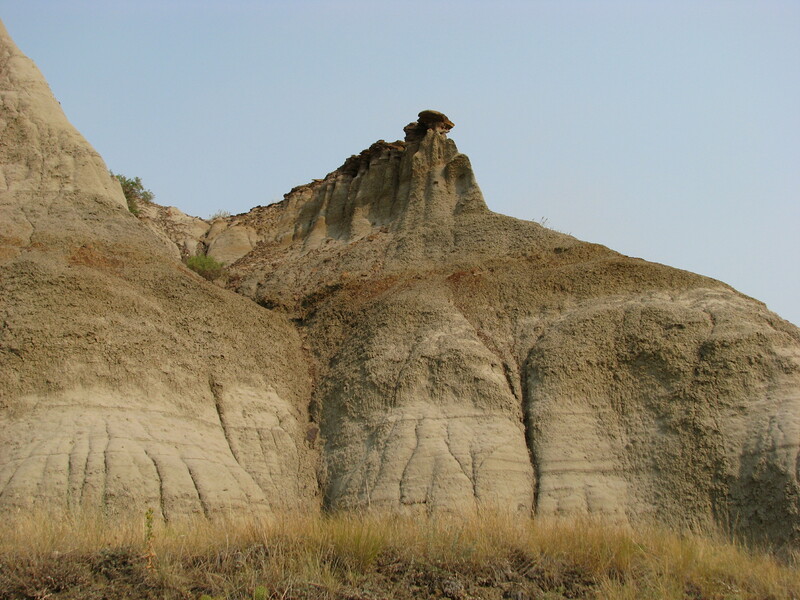 If you know anyone obsessed with dinosaurs, then you have to go to south-central Alberta. The Royal Tyrrell Museum in Drumheller is undeniably world class. We’ve also experienced the Smithsonian Museum of Natural History in Washington, DC, which has a fantastic section on dinosaurs along with many other breathtaking exhibits, but if you want full-on dinosaur then the Royal Tyrrell is the best place to go. Really it’s only drawback is that its is an hour and a half drive from Calgary and, it seams, no-where near anywhere else. Here is some advice to justify the trip out there. 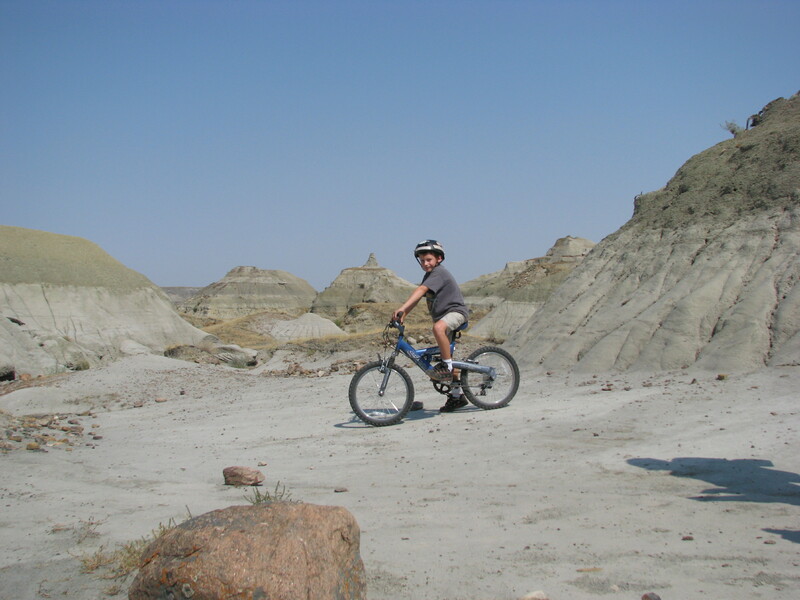 Augment your holiday with a couple of nights at Dinosaur Provincial Park, a 2 1/2 hr drive east, and you’ve got yourselves a Dinopolooza family vacation. I got a “we’re so lost” feeling driving here on route 876 because when you believe you must be getting close, you still can’t see it. Finally, when you get very close, you see some signal flags then realize its down inside a canyon. Once inside, you’re in the badlands. As their website says, it’s “like stepping into another world.” You’ll love it’s beautiful layered canyon walls. Even moreso, you’ll love the various programs offered that bring the dinosaur fossils and bones you saw at the Royal Tyrrell museum to life. 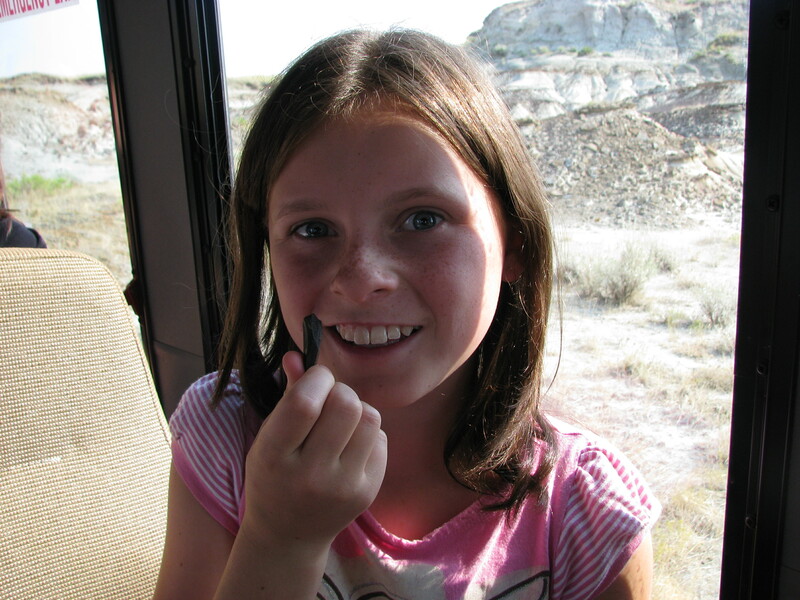 The area has an abundance of actual fossils that you can help discover. Its one of UNESCO’s World Heritage Sites though so it is protected from over-poaching from people like you. 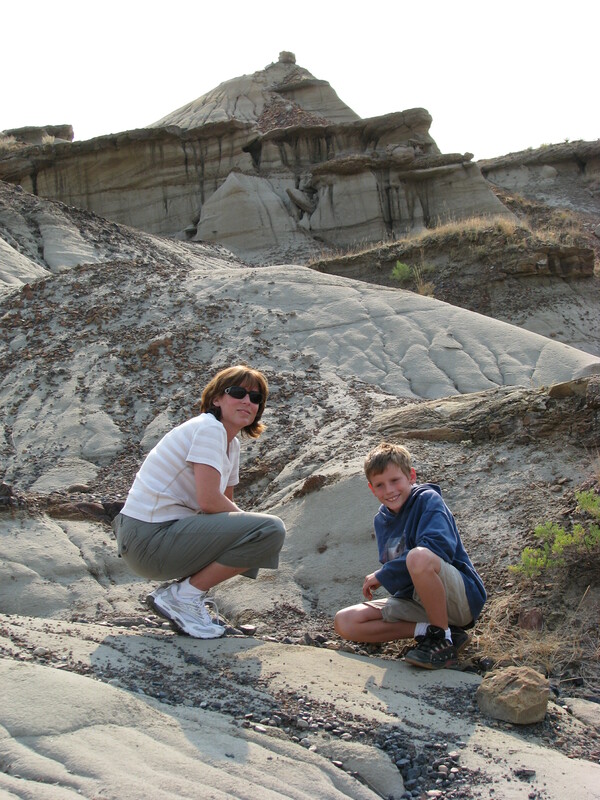 Take one of Alberta Parks’ guided tours or Dino Digs to explore, or go on a photography safari. 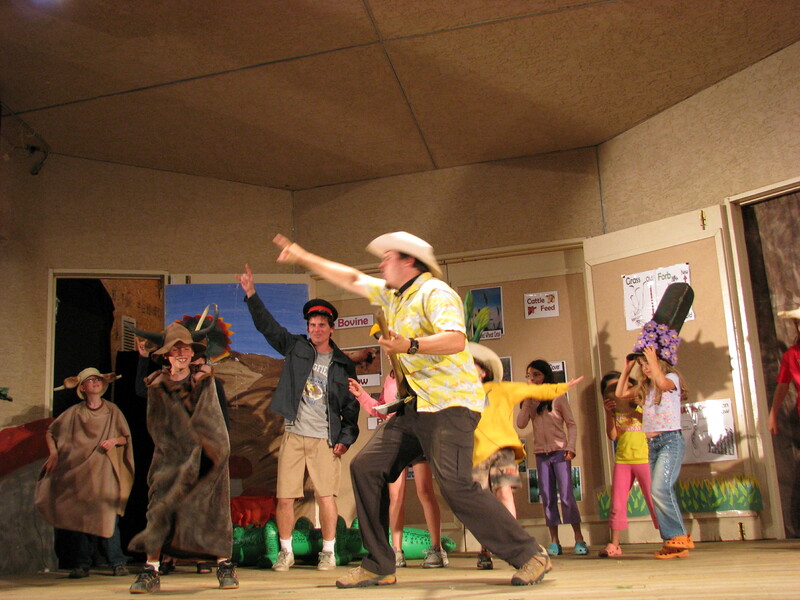 Attend one their theatrical shows at the amphitheater and possibly end up on stage like we did. 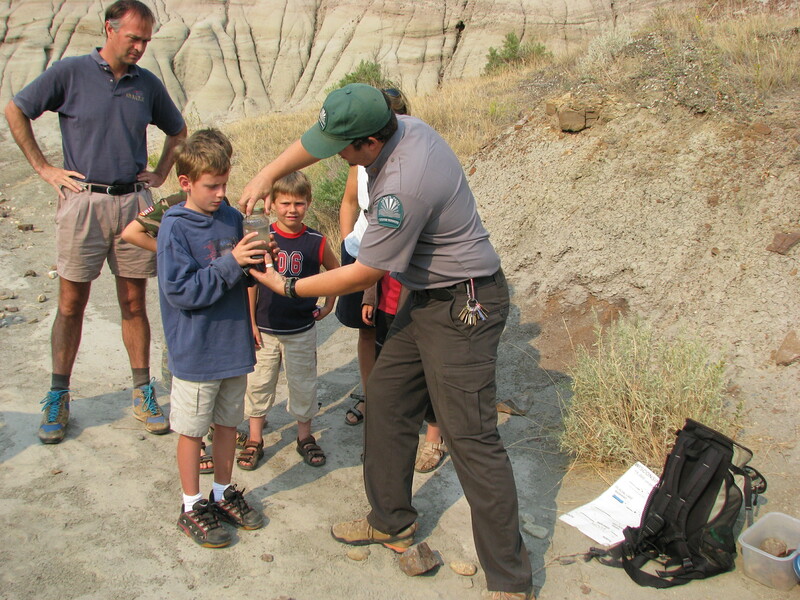 There are many interactive paleontology activities you can do; real hands-on, dirty things that kids will love. While there are some cottonwoods around, you’ll be sleeping under the stars. No canopy of trees to separate your trailer from Alberta’s living skies (sorry Saskatchewan, you’ve got no monopoly on that slogan.) You’ll experience the heat of the day and expect a thunderstorm to brew up in the evening. Keep reading about our trip and the memorable storm that arose on day 3. In 2009 the rain here fell so hard it flooded the canyon and campers had to be evacuated, but that was not during our 2007 visit and is unlikely to affect your trip either…one hopes. The campsites are located close to the dinosaur center where you can book tours, buy snacks, use flush toilets and such. There are hiking trails that originate from that travel center, as well as other parts of the park. 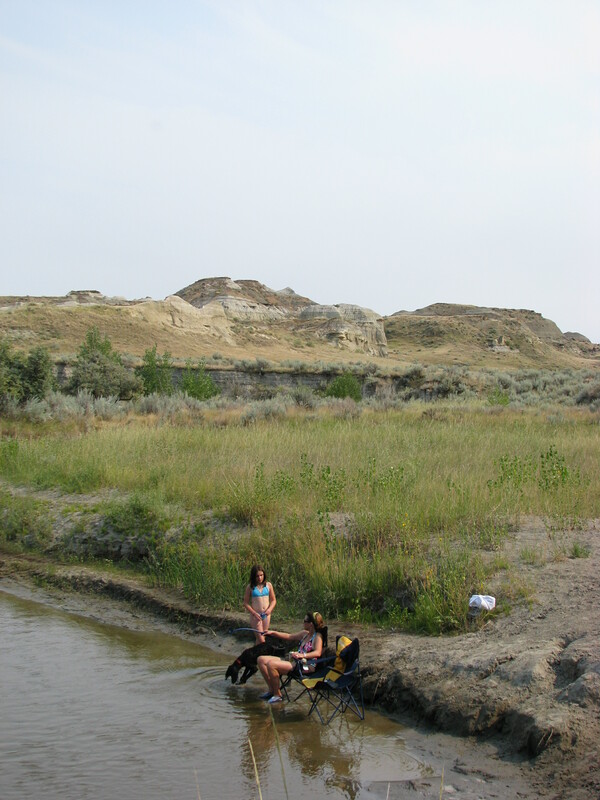 The campsites are also close to the river which allows you to cool off after digging up the dust looking for dinosaur remnants. we stayed a few nights in our tent trailer and didn’t need power or water so stayed in one of the back sites: #46. It was a bit of a walk to places, but we were young then and didn’t mind. The location was very scenic with canyon walls surrounding us. The site was flat and easy to set-up in. It seamed similar to the other choices in the upper loop. Going by a failing memory of 8 years ago, the sites on the lower loops may have had more cottonwood trees for additional shade. Since the entire campsite flooded since our visit, I’ll blame that if you encounter anything different. The unearthly scenery still sticks in my head after 8 years. Alberta Park’s fantastic hands-on dino activities! Getting volunteered to come up on stage one-night to help act out why native bisons were better for the prairies than cattle. Are we ever terrible actors, but at least we enjoyed ourselves. A long drive from wherever you are now. I wouldn’t go here just to go here, but tying it together with a trip to the Royal Tyrrell museum in Drumheller made for one great dinosaur vacation with our kids. 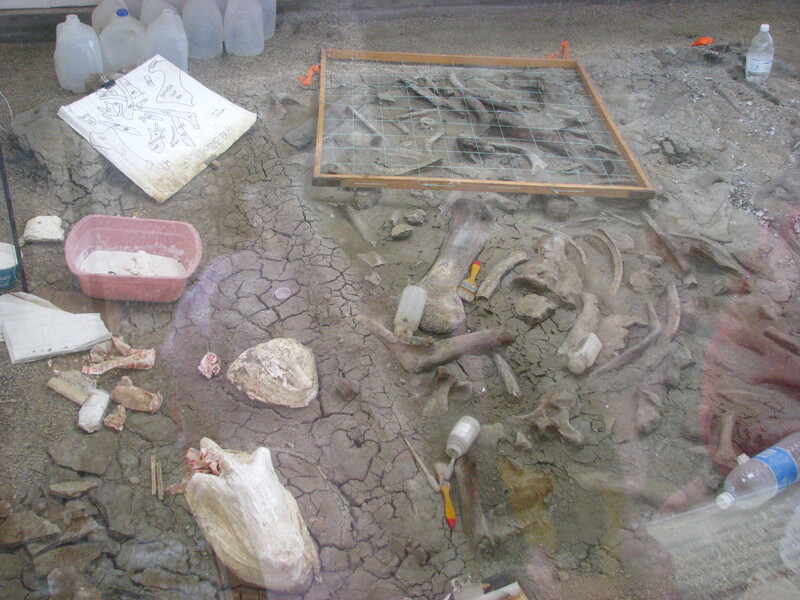 You came here to look for dinosaur fossils, so take the guided tour. You can see actual places where actual dinosaurs lie…at least what’s left of them. Its a long way from Vancouver’s regional district to Dinosaur Provincial Park, but we included the Rockies and Calgary on the 2 week trip as well. Watch for future blogs on some other campsites in those areas. We spent 3 days camping here, and that was perfect for us. Suspect many people would prefer a 2 night stay. 4 may have been too long unless you’re a total paleontology geek in which case you may never want to leave. Can you spot Blair on the canyon wall? Day one we got oriented and went to the dinosaur center to book our guided tour for the next day while we checked out the interactive exhibits. Blair went for a trail run along the hiking path while the rest of us took a million photos and a dip in the river, and then saw a theatrical explanation of dinos. On the second day we took one of the tours. 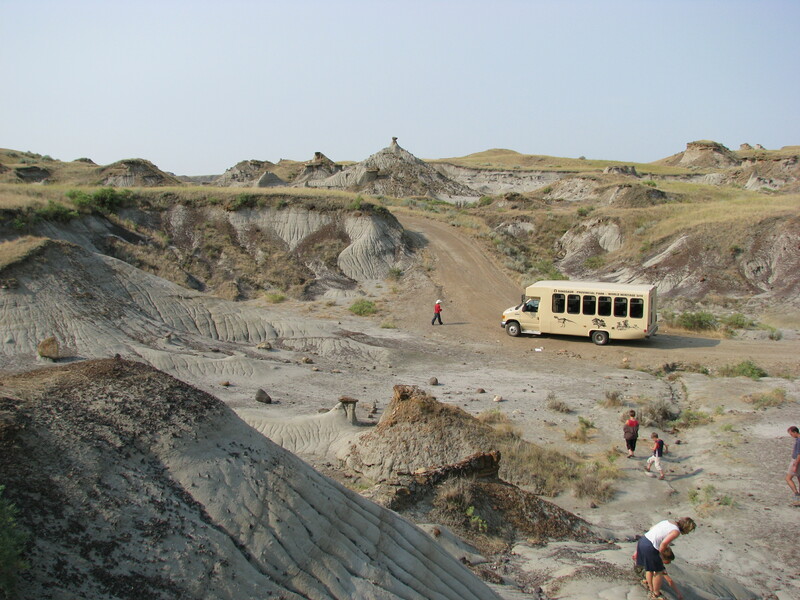 They bus you a little further into the badlands stopping a few times to allow you to check out certain fossil beds. 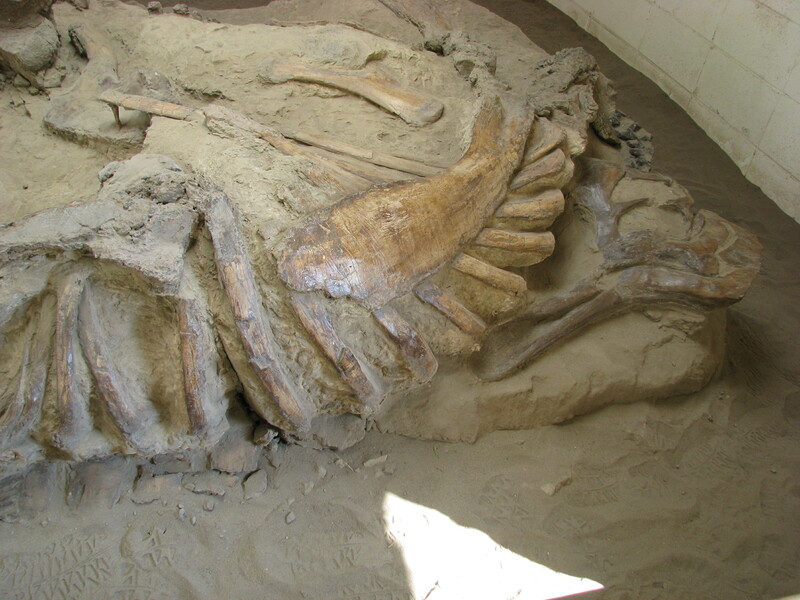 You can clearly see dinosaur skeletons which is incredibly cool. Lots of educational value, some of which we learned at the museum earlier in the week but seeing things out in the real world really brings those bad beasts to life. The walking is easy on these tours and the bus rides were short and comfortable. After the tour, we hiked a park trail as a family. Our son loved riding his bike so we took it on the hiking trail. Ended up carrying it a lot of the way as the last part of the path required too many jump-steps from boulder to boulder. Saw the nightly theater show and this time we ended up being pulled up to participate. The host actor was amazing..unlike us. We talked to him afterwards and learned the actors here are real park rangers. The rangers who really enjoy entertaining people seek jobs at this park just so they can perform in these shows. Apparently they have to audition and need to be very good to earn the role. Don’t come expecting a Broadway caliber extravaganza but they are a notch or two above a normal park amphitheater shows. As a bonus, he also hosted our fossil tour and used those entertainment skills to make that excursion more fun. Day three involved more fossil hunting and hiking. The highlight of the day was a spectacular storm that brewed up after supper. People sat in lawn chairs on their campsites just to watch the lightning strike across the sky, over the canyon walls. From a distance is was absolutely beautiful and awe inspiring. Better than any man-made fireworks show. You can see forever on the prairies so it took a long time for the storm to hit our campsite. When it finally came, it came hard. Hail the size of marbles fell, sending us inside the tent trailer. It was incredibly loud with the hail pebbling the metal roof, with the thunder being so close, and because all that sound echoed off the canyon walls. The storm must have lasted 30 minutes before it passed. It took a good night’s sleep before the numbness in my ears went away. The next day we drove 45 minutes to Brooks, on the TransCanada Hwy. Enjoyed the civilization of a Canadian Tire, Boston Pizza and Husky Gas, but we didn’t stay very long. Drove 3.5 hrs to Banff for more camping. Banff was very different: barely above freezing high up in the Rocky mountains. Which did we prefer? 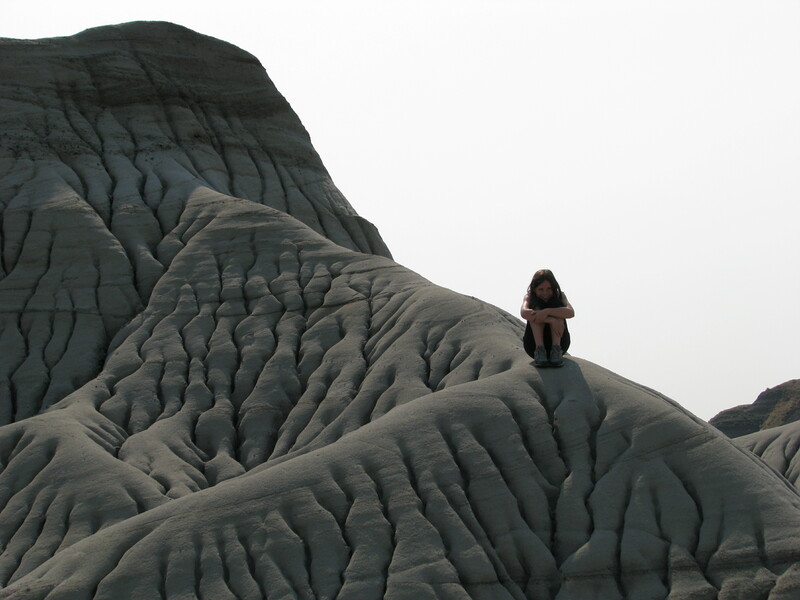 Well, I can’t speak for the whole family..maybe this is just because I’ve been to the Rockies quite a few times already… but I’d recommend Dinosaur Provincial Park. 8 years later I still thoroughly enjoy the memories of the fossil finding, dinosaur bone sightings, it’s unique and unworldly beauty, and even the big storm. Banff’s beauty is world famous for good reason though so if you haven’t grown up in British Columbia you might prefer the mountains over the badlands. If you’re coming from the coast then to get to south central Alberta you have to drive through the Rockies anyways so do like us and make both part of the same family camping holiday. Bring your camera. 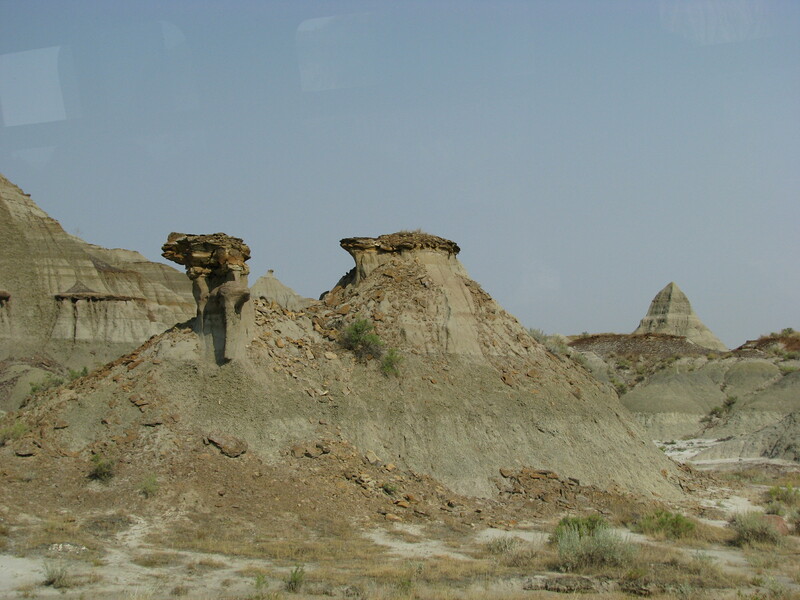 We’ve been thinking about going to Dinosaur Provincial Park for a while now, instead of taking our usual weekend trips to the west. 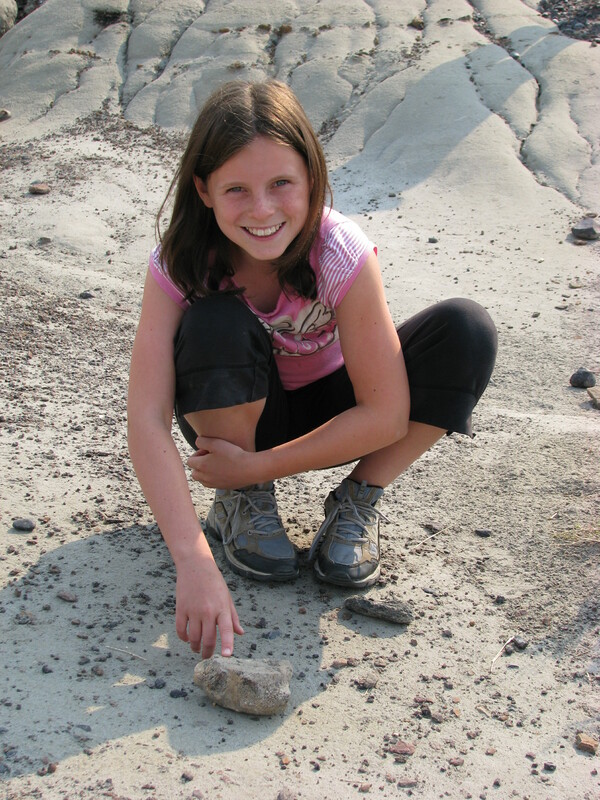 Would be great doing searching for fossils! Guess you have to do a guided tour for this, you can’t wander around on you own? Thanks for following our blog. 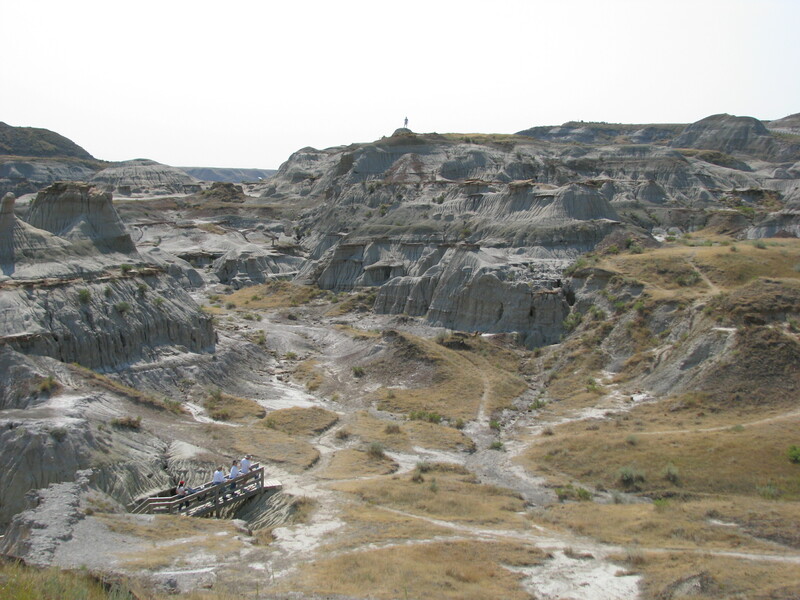 Visiting Dinosaur Provincial Park is a great trip and the guided tours are worth the time and money. 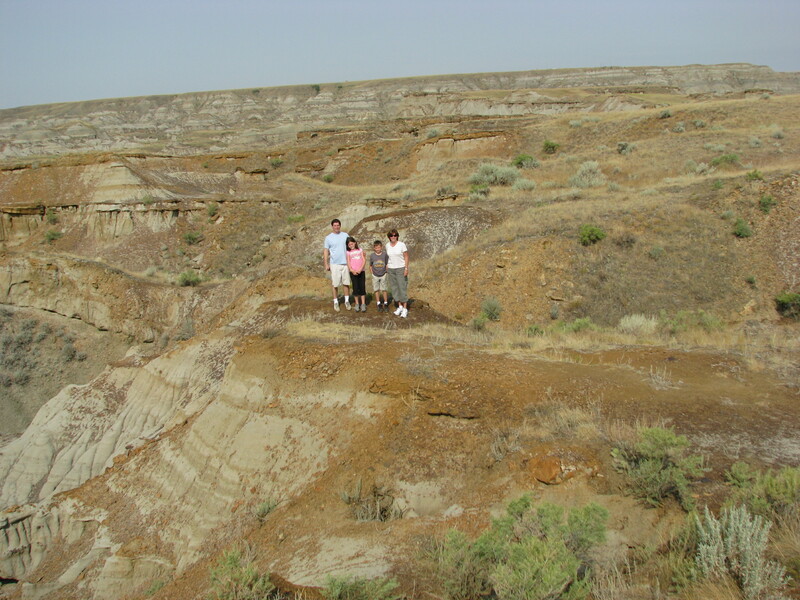 Tie it in with a trip to Drumheller and you have a very interesting trip. Throw back Thursday I am re logging one of the best vacations a family can take. I’ll bet the guided tours were very interesting. It’s fun when you can relax and discover in the same trip. History of any kind I find exciting. Looks like a great trip. Yes is a rest trip for every age group.